Isobutene is a volatile gas which is currently extracted from fossil sources such as oil. As an important derivative molecule, it represents one of the foundations of the petrochemical industry, from which many more economically-significant chemical products are manufactured. The process for the fermentative production of isobutene from sugar-based raw materials, developed and patented by Global Bioenergies, offers itself as an alternative to those processes which are based on fossil fuels. For this to occur, optimised micro-organisms which are able to metabolise sources of sugar from the first and second generations and to directly produce isobutene in the form of gas were developed in the laboratory specifically for this purpose. The innovative fermentation process was initially tested and further improved in the laboratory and, subsequently, on a pilot scale before being transferred over into demonstration plant-scale production. The aim of this plant is to demonstrate a robust, reproducible and economic operation of the process. When it came to building this demonstration plant, the choice landed upon the Leuna industrial park, based on its very well built-up and already-existent infrastructure, and based on the technical know-how available at the location. With finalisation and start-up completed, the plant is now in stable process operation using first generation resources. Currently, the plant is being adapted to allow for the use of second generation resources. However, the final step towards shorter and more efficient carbon cycles with higher sustainability is in the use of third material generations such as CO₂ emissions from industrial fumes (CO₂, CO, syngas). As a company which was already been occupying itself with processes which use third generation resources from an early stage, Global Bioenergies took over a small Dutch company in 2017, which it is using to forge ahead with the development of this technology. Biomass is increasingly being viewed as an alternative raw material for fossil oil, which represents a finite resource. In order to reduce the problems of climate change and to strengthen an independence of the European nations from fossil energy resources, research in the field of the use of renewable resources is an essential part of bioeconomy. To this end, Global Bioenergies is working together with industrial partners who are promoting this research, as well as putting it into practice. For example, in the field of raw materials supply, it has a collaboration with one of France’s largest sugar producers. It is currently also in talks with the German industry and, of course, the Saxony-Anhalt location, as Germany’s biggest sugar factories are based here. 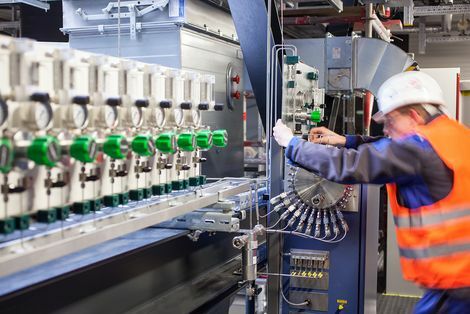 In the field of the fuel industry, Global Bioenergies is working together with Audi, who have already successfully tested a new type of fuel mixture in their vehicles. To this end, isobutene was processed into isooctane and other components. This can be added to traditional fuels to a level of up to 30% and, in doing so, achieves a reduction in the fossil CO₂ emissions of up to 70%, improved performance, and reduced particle emissions. And all this without having to undertake any adjustments to the existing engine! What’s more, isobutene can be used in other branches of the economy and industry to reduce the use of oil: as aviation fuel, plastic, rubber, dye, lubricant and in cosmetics. A current key topic is the field of renewable fuels which can be produced from renewable raw materials. The isobutene process developed by Global Bioenergies, and its resulting derived products, can be used to make a contribution towards environmentally-friendly fuels here too. Through the European Renewable Energy Directive (RED), EU member states are obligated to reach the target of a 10% use of renewable fuels by 2020. A part of this must come from second generation biomass. Today, Global Bioenergies has already made it possible to replace this part and, thus, to reduce carbon dioxide emissions. In doing so, Global Bioenergies is one of the few companies worldwide, and the only one in Europe, which is developing and using the fermentation process to transform renewable raw materials into hydrocarbons. In doing so, notable and successful companies are providing support to the still-young company from Leuna, such as Audi, Repsol, SkyNRG, Butagaz, L`Oreal, Clariant and Arkema. A good collaboration exists with Fraunhofer CBP, also on location. They are operating the existing demonstration plant together, where the initial fuel components are being produced. The first comprehensive production plant, in a joint venture with Cristal Union named IBN-One, is currently being prepared.